Will you be tweeting this Thanksgiving season? Well, you should be. Life is meaningless unless you can boil it down to 140 characters or less, after all. So that's where Tweetsgiving 2009 comes in. The 48-hour event spans Nov. 24 thru Nov. 26, courtest of nonprofit group Epic Change. Their goal? Changing the world through gratitude. Aww! Last year, thousands of Tweeters from across the globe tweeted about what they're grateful for, and in the process, they raised more than $10,000 to build a classroom in Arusha, Tanzania. This year’s goal is to raise enough to build a technology lab at the school. 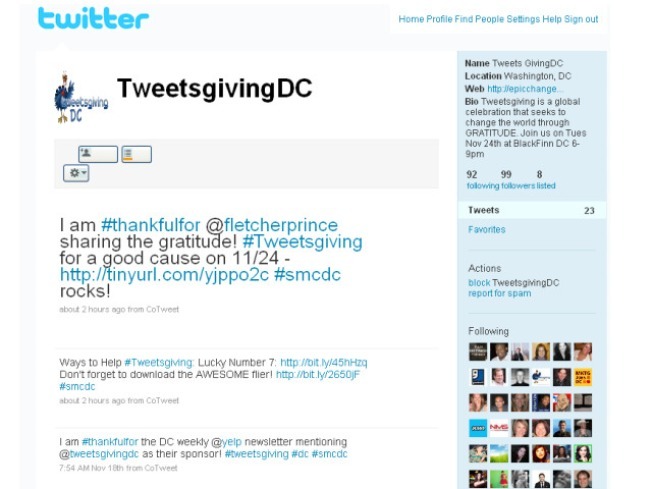 Be a part of this generous cause by joining ThankfulFor.com for a Tweetsgiving happy hour Nov. 24 at BlackFinn DC (1620 I St. N.W.) from 6-9 p.m. During the celebration, you will also have an opportunity to share what you are #thankfulfor. Ooh, hashtag humor! Bring along a small donation of needed items for My Sister's Place, a D.C. women’s shelter. Join the D.C. group of event updates and get tickets here. Tickets start at $10 and go up to $100 depending on how much you’d like to donate. All proceeds go to Epic Change. It will be a great #Tweetsgiving for all!